OBX Media revs up online presence for a new OBX dune buggy rental company with a responsive, mobile-optimized website and brand. New street-legal dune buggies available in the 2016 Outer Banks summer vacation season. A well-designed, user-friendly and search optimized website is important for a new business trying to build their online brand presence in the vacation rental industry. OBX Media designed a brand new mobile-responsive website on a WordPress platform which is easily accessible to travelers anywhere, anytime. "A well-designed, user-friendly and search optimized website is important for a new business trying to build their online brand presence in the vacation rental industry," said C.K. Evans, owner of Outer Banks Media. The new website creates a strong brand image with simple navigation and the important information is easy to find. The bright colors, typography, and product images provide eye-catching visuals and easy to read text. Site visitors are able to view the dune buggy collection and easily contact a Buggin’ Out representative via the contact forms on each dune buggy page. Rental rates are straightforward and easily found at the top of the rentals page. 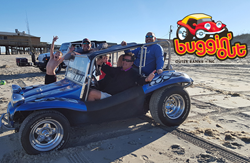 To explore the website and find out more about what Buggin’ Out is bringing to the Outer Banks of North Carolina, visit http://bugginoutobx.com. Outer Banks Media, a Google Certified Partner Agency, provides marketing and advertising consultation services to small and large businesses all over the nation. OBX Media specializes in website design and development, pay-per-click management, search engine optimization services, social media marketing, and an array of traditional marketing services such as print, TV and radio. To learn how to increase web traffic and build online sales, please visit http://www.outerbanksmedia.com or call 252-256-7116.